Home › Line of Fire › Michael Brown’s Apostolic Friends Lou Engle, Mike Bickle, Reinhardt Bonnke & Benny Hinn. 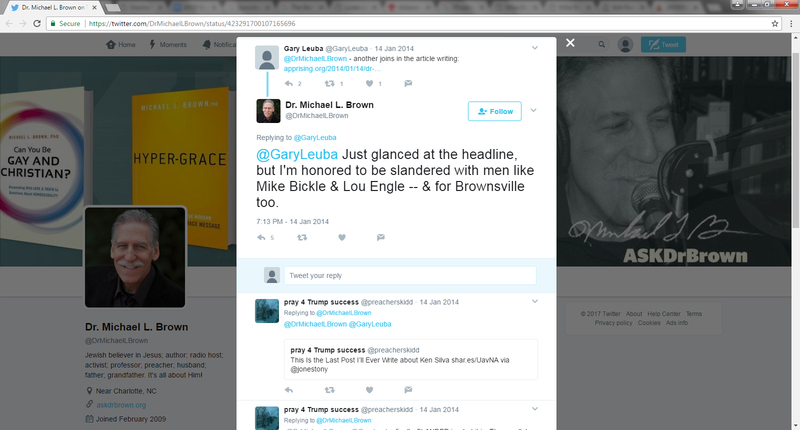 Is Dr Michael Brown deleting comments and threads to preserve his reputation? Are screen shots of those comments and threads becoming the only way to prove (without a shadow of a doubt) that Michael Brown is doing some sort of ‘cover-up’ damage control? It is important to note that while claiming he isn’t part of the New Apostolic Reformation (NAR) or to be one of its NAR Apostles, he is good friends with key NAR Apostles in this global cult and has no problem endorsing them. Mike Bickle is an Apostle of iHOP, well known for his apostolic preaching. Lou Engle has been an Apostle since the inception of Che Ahn’s H.I.M. ministry since 1996. Reinhard Bonnke is also an NAR Apostle. And don’t forget that Benny Hinn also claims to be an Apostle. In answer to Michael Brown’s question, no one should be ‘fine’ with Michael Brown having friendships with any of these frauds. Their teachings are heretical and causing division. And despite the very occasional mention of the true gospel – their own more highly promoted version, the NAR ‘Gospel of Power’, is what puts them outside the Christian faith. They can claim the blood of Jesus as much as they want. However, if the blood belongs to a false Jesus, how can it save them? If their faith is in a false gospel, how can it save them? If their false Jesus and false gospel can’t save them, why are they perceived as being Christians? If God is truly speaking to Michael Brown (as He is through His Word), why hasn’t he exhorted them to stop preaching this false gospel? 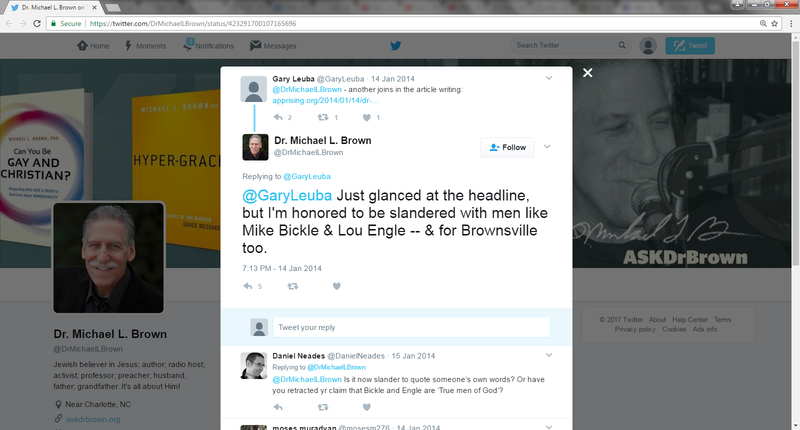 @GaryLeuba Just glanced at the headline, but I’m honored to be slandered with men like Mike Bickle & Lou Engle — & for Brownsville too.